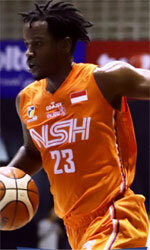 Garuda Kukar Bandung (IBL) inked 22-year old American guard Jamal Ray (193-95kg-95). He just graduated from LSU-Shreveport (NAIA). In 35 games he recorded 13.4ppg, 10.2rpg and 1.7apg last season. Ray was a dominant performer for the Pilots averaging a double-double for the season as he netted double digits in 27 games this season and pulled down double digit rebounds in 23 games for a total of a NAIA leading 20 double-doubles. He scored a season best 23 points against Wiley College and pulled down a season high of 18 rebounds against Langston. Ray was the team leader in rebounds (356) and was second on the team with 27 blocks. LSU Shreveport advanced to the semifinal of the 81st Annual NAIA Division I Men's Basketball National Championship and finished with a 30-5 record for the season.